A burst of creativity – six books published in three months! At the end of September, Sian Northey’s short story collection, Celwydd Oll, was launched and featured finely-observed tales of individuals caught up in history. Sian was awarded a PhD from Bangor University in Creative Writing in 2018 and some of the short stories she composed as part of her doctorate feature in this latest collection. Ruth Richards, a PhD candidate at the School of Welsh, recently published her second novel, Siani Flewog. The novel tells the story of the 5th Marquis of Anglesey – a flamboyant character infamous for his lavish spending habits and for the dazzling theatre productions he held at the family home, Plas Newydd, at the turn of the 20th Century. Eira Llwyd is Gareth Evans-Jones’ debut work of fiction and focusses on the harrowing experiences of a group of Jews during the Holocaust. The novella has already received glowing reviews for its succinct and delicate prose after it came close to winning the Prose Medal at the National Eisteddfod in Anglesey in 2017. After gaining BA, MA and PhD degrees at the School of Welsh, Gareth was recently appointed to a lectureship in Religion and Philosophy at the School of History, Philosophy and Social Sciences but still maintains a close link with his old alma mater. Mared Lewis, currently in the final stages of an MA degree in Creative Writing at the School of Welsh, is a well-known and highly-regarded author. In November, she published her second novel for Welsh learners as part of Gwasg Gomer press’ ‘Amdani’ series. Llwybrau Cul is a tale of mystery and secrets set in rural Wales. 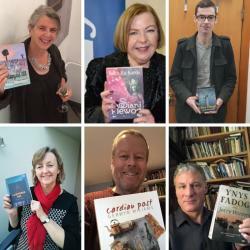 Cardiau Post is Professor Gerwyn Wiliams’ latest volume of poetry – his fifth to date – and was launched in the company of a large and receptive audience at Galeri in Caernarfon at the end of October. Two weeks later, Professor Jerry Hunter also published his latest novel, Ynys Fadog – an epic that chronicles the growth and decline of a Welsh community in Ohio from the early 19th Century to the dark days of the Great Depression in the 1930s.